On the western side entrance of the Penobscot River, off Fort Point Road inside Fort Point State Park. Lighthouse buildings and tower are private residence, but the grounds are open to the public. A famous land and sea battle of disastrous proportions was fought here on August 14, 1799. Under the command of Colonel Paul Revere and Commodore Dudley Saltonstall, 43 American ships were sunk and scattered all over this area of Penobscot Bay, and 1,000 soldiers fled from a smaller force of British ships and troops. 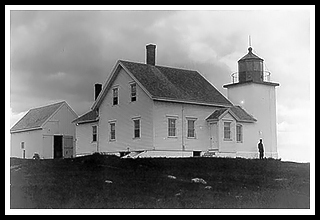 With the booming lumber trade heading to Bangor, and increased shipping of Maine potatoes, there became the need for a lighthouse to guide traffic along the Penobscot River. Fort Point lighthouse, was built in 1836 under the presidency of Andrew Jackson, it was rebuilt in 1857. It stands 88 feet high above the sea. The unique bell tower is one of the few bell towers left in Maine, and is listed in the National Register of Historic Places. The original fog bell house still exists. The outside of the lighthouse is square while the inside contains brick interior lining and stairs going around in a circular pattern, making it the only unique structure of its type in Maine. The light was automated in 1988. Because of its desirable location, the lighthouse had only four lucky keepers stationed there from the 1880’s into the 1930’s. 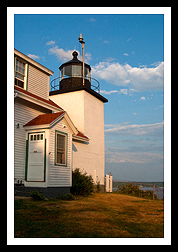 This lighthouse is set in a quiet remote area atop a high point of land on the west side of the Penobscot River for some wonderful views. It resides within the small artist community of Searsport, which is also home of the Penobscot Marine Museum which includes eight historic buildings housing collections of marine art, artifacts, and maritime heritage. This historic town has plenty of specialty shops, restaurants, and antique shops to explore. Although the lighthouse is closed to the public, a state park employee and family occupies the keeper’s dwelling all year and you can walk the lighthouse grounds. These people will let you take photographs of the lighthouse and its unique one of a kind fog bell house that still stands. You can relax and picnic at Fort Point State Park, which is part of the lighthouse grounds, and walk along some of the short trails there. You can tour the nearby ruins ofFort Pownall, a French fort built in 1759 during the French and Indian Wars. Heading up Route 1 along the coast and following the Penobscot River, you’ll come upon two amazing architectural structures, the Penobscot Narrows Bridge and Observatory, and Fort Knox. Take a one-minute ride on the fastest elevator in northern New England, which will take you to the top of the tallest public bridge-observatory in the world. The observatory lies at the top of one of the bridge towers, a dizzying 420 feet high! Before crossing the bridge, the Fort Knox Historic site is right nearby, and is one of the best-preserved fortifications on the New England seacoast. Fort Knox was established in 1844 to protect the Penobscot River valley. 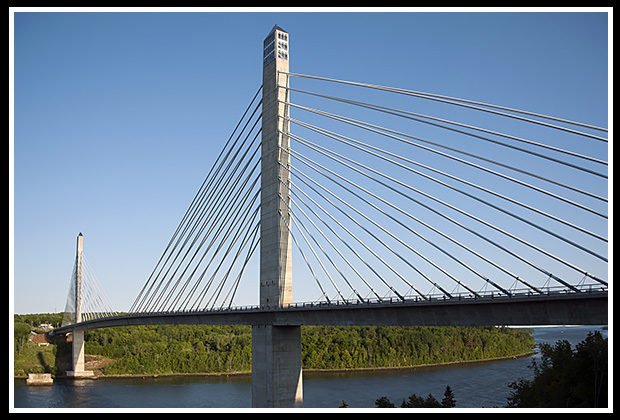 The bridge itself follows the same design as the Zakim Bridge in Boston, the road lies high above the Penobscot River at 135 feet above the river. From US Route 1 in Camden go north through Belfast & Searsport. North of Searsport, turn right at the Stockton Springs sign. Take East Cape Road to Fort Point Rd, turn left at the park's entrance and continue to the park's parking area. If the park gate is closed, continue on Fort Point road to the "Y" intersection and bear left at a large dirt parking lot and go past the entrance to Fort Point State Park. Take the next left for a about a mile to a small dirt parking lot. For those who are coming in by boat, there is a 200-foot pier at Stockton Springs available for visitors. 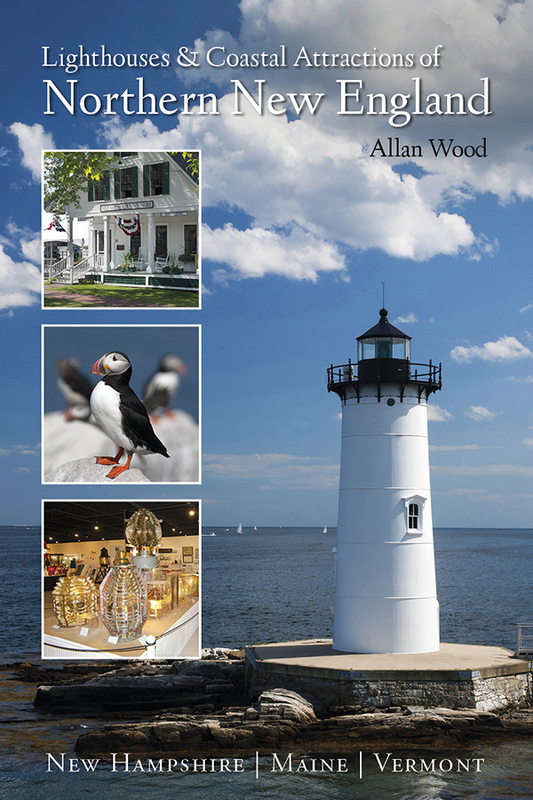 My 300-page book (with over 360 images), Lighthouses and Coastal Attractions of Northern New England: New Hampshire, Maine, and Vermont, provides human interest stories from each of the 76 lighthouses in northern New England, along with plenty of coastal attractions and tours near each beacon, with contact info to plan your special vacations.